" ... it's hard to compete with the Internet, video games, cable television and DVDs, said Lori Kramer, sales and ticket services manager at the Portland (Ore.) Center for the Performing Arts.
" 'I think that it isn't just any one thing,' Kramer said. 'Younger people are used to more interaction, more things going on to keep their attention, other than just someone sitting in a chair playing a violin.' "
Performing arts venues, at a loss for revenue, are frantically spicing up their acts with lights & electronica. But the answer is much simpler, and harks back to when people first boogied to a rhythm: don't separate the performers from the audience. Make a community. "The Opera at Florence is a place where the people of quality pay and receive visits, and converse as freely as at the casino ... this occasions a continual passing & repassing to and from the boxes, except in those where there is a party of cards formed; it is then looked on as a piece of ill manners to disturb the players. I was never more surprised, than when it was proposed to me to make one of a whist party, in a box which seemed to have been made for the purpose, with a little table in the middle. I hinted that it would be full as convenient to have the party somewhere else; but I was told, good music added greatly to the pleasure of a whist party; that it increased the joy of good fortune, and soothed the affliction of bad. As I thought the people of this country better aquainted than myself with the power of music, I contested the point no longer ... "
Live music ... is for life. 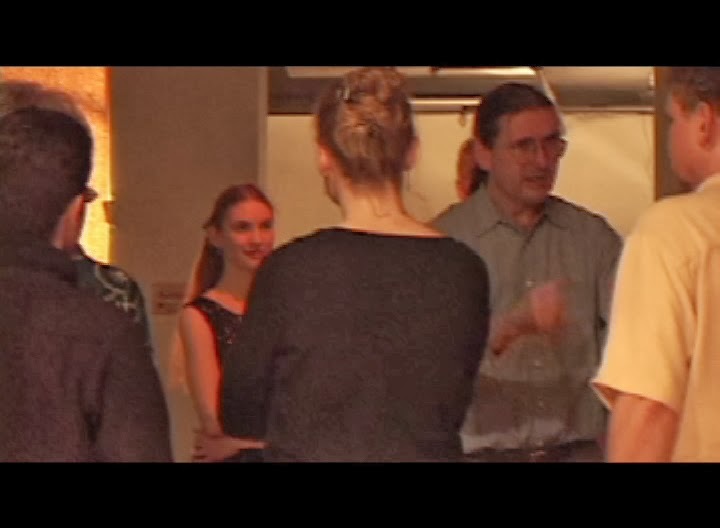 As demonstrated by Ev Marcel & Robert Hauk ... First we turn down the ambient Tango music. 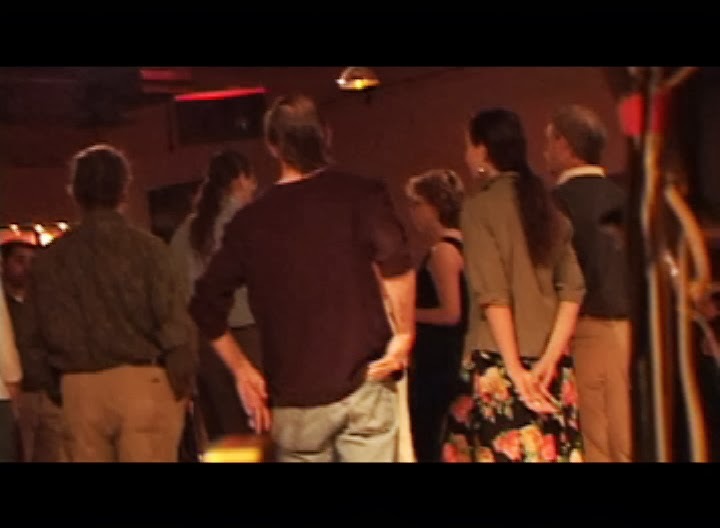 Then we get everyone on the main floor. We quickly decide how to divide the group: beginner/intermediate, raw-beginner/beginner etc. We split up. 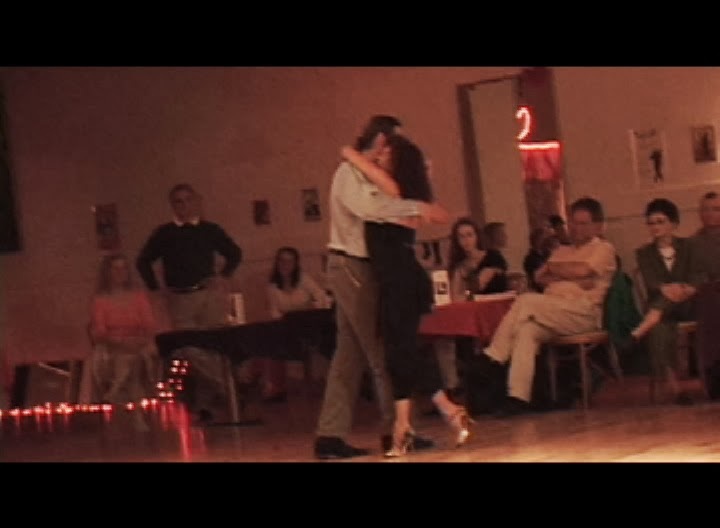 We turn up the music, slow steady tango, no higher than "just audible". But it's always running. When a teacher is talking, we turn down the music on their side of the room. When students start dancing, we turn it up on that side. Luckily, we have two separate floors, both quite large. 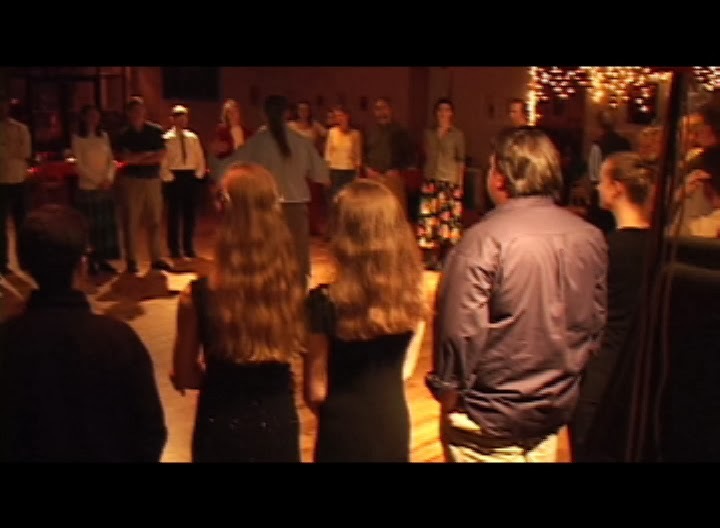 The tendency is for teachers to talk through the beginning of the song on both sides, and then people dance for 2/3 of a song. Or the teacher talks through most of a song, and then the students dance the rest and the next song. 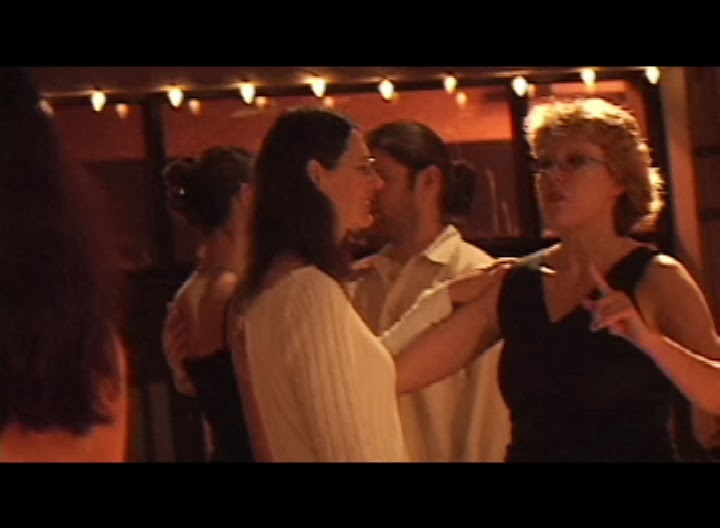 SO the DJ should be ready to turn down the music a lot at the end of a song. Even though it keeps running at low volume. The class runs about an hour. Encourage stragglers to come into the classes. Let both teachers know, when you're two songs before the end. After those songs, stop the music. 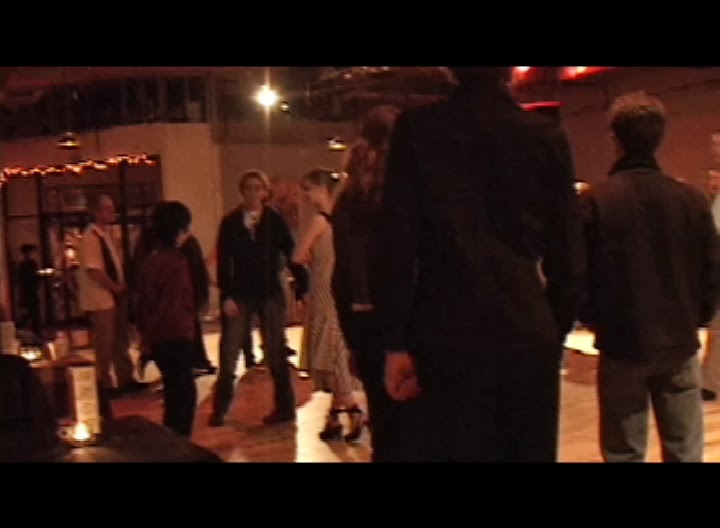 Robert tells the non-beginners that they will go dance with the beginners now, for the first Tanda of songs in the Milonga. Ev tells the beginners the same thing. The non-beginners merge with the beginners. Brief announcements & group self-congratulatons. Turn down the lights. 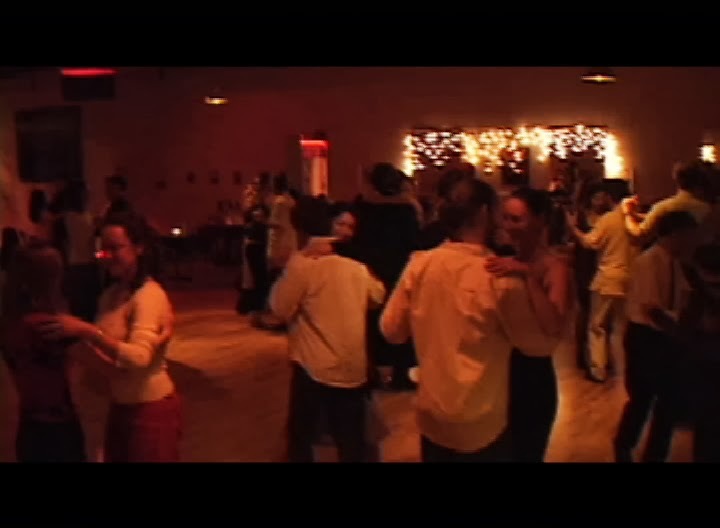 The milonga starts with great energy. After 45 minutes, to keep the beginners around, Robert Hauk & Alicia Pons do some deeply lovely performances. It worked like a charm.